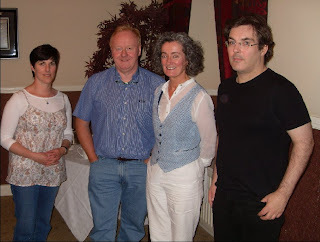 My other writing group, the Cavan/Meath LitLab group, organised a workshop with Patrick Chapman last evening. This was a very worthwhile event. Patrick attends a workshop himself regularly and he ran ours in the same way using the same rules. So as with our regular meeting we each had a piece and everyone commented on it. We did get the pieces in advance which we normally don't. Our own meetings are rather informal with no rules as to who can comment in what order but Patrick's are much more formal. The author reads his/her piece without introduction and each of the others comments in turn. Then and only then can the author reply or explain. No interrupting! Everyone writes comments on the piece and gives these to the author at the end. It worked very well. The formal responses meant that everyone had to comment on each piece, no hiding. This ensures that everyone gives as well as receives. We all agreed afterwards that we should try these rules for our LitLab meetings in future. Patrick's most recent collection, The Darwin Vampires, is available from SalmonPoetry. Our haiku coasters/beer mats are being reprinted for this year's Fleadh in Cavan and we are also doing poetry postcards, with short poems and suitable graphics. We also will be reading during the Cavan Fleadh. Picture above: Patrick Chapman, right, with three LitLab members. Suddenly it's upon us, the Trim Swift Festival starts on this Thursday. That must mean that our annual Battle of the Books is on Sunday. I understand that the other group has been hard at work preparing to defeat us again this year. While we were listening to Italian poets last Thursday they were locked away in an upper room finalising their line ups, their content and getting their timings just right. Our spies tell us that we haven't a hope. Their finely honed content is excellent, no out of date jibes at bankers, politicians or the like - so last season! - but really good satire at unexpected targets, very Swiftian. Our own final (also the first) rehearsal is on later this week - well it has to be before Sunday! - at a secret location (I hope somebody tells me where). Seriously our only hope is that the others have peaked (peeked?) too early and will have gone stale by Sunday. Next year they will be going for three in a row!! Oh dear. The Battle of the Books is part of the Theatre as you Dine event on Sunday in the Trim Castle hotel. Details here. Picture above: Local artists put the finishing touch to a brilliant painting of Gulliver at the old salesyard, Summerhill Road, Trim. I love the watch detail. Now is that a murial or an alfresco? And who asked was there going to be anything about Swift in this year's festival? 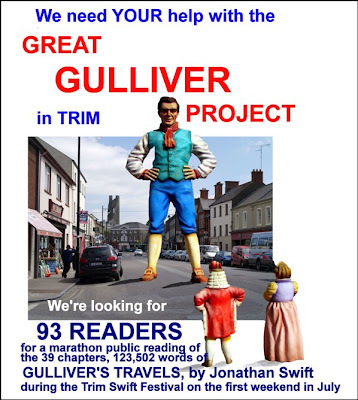 Reading of Gulliver’s Travels for Aware at Trim Swift Festival organised by Paddy Smith of the Boyne Writers and Trim Swift Festival and a few other things as well. It will take 15 hours over 4 days to do this reading. They need 93 people to do it. Each will read 3 pages of the book (copies of the book supplied on the day). Readers sit in the back seat of a Suzuki Swift car on Market Street, Trim. The car will be in position for five hours of readings each day during the festival. Each reader will pay €5 for the privilege of taking part in this project, with all the proceeds going to the charity Aware, and each will get a special certificate to show that they took part. Listeners (if there are any) will be able to pay €2 each to sit in to the front seats of the car to listen for 15 minutes. Sunday 3rd July (10am to 3pm). Why not be a part of this historic reading. contact Paddy paddys@iol.ie and give him an idea of what time would suit you and he'll slot you in as close to that time as possible. The slots available are here on the website, which is updated every day. 1. Elizabeth Power, Galway. Oh Come, all ye faithful. 2. Maureen Gallagher, Galway. We are where we are. 3. Margaret Costello, Drogheda. Letter from Christine LaGarde. The judge was Donal Kelly, RTE. Judge's comment: Tight, spare, writing and lightness of touch lifted the winning entry clear of the pack. In contrast, many of the others made heavy weather in referencing the faults of builders, bankers and politicians. Four years into the recession it was all a bit passe. The exception was the runner-up who showed imagination and humour and gave us a neat Swiftian ending. The winner is invited to read her winning entry at the official opening of the Trim Swift Festival on Thursday next. 'There are not enough tongues in the world for poetry, not enough voices, not enough words, not enough languages' Dave Lordan says in his introduction to the POETHREE new Italian voices collection with poems in Italian and their translations, mostly by Dave. The three poets featured in the book were our guests at the Boyne Readings last evening at what was one of the most enjoyable and memorable of these nights. MC Paddy Smith excelled himself with a wonderful (I think) introduction and welcome in Italian. Dave Lordan read a translation followed by each poet reading the original in Italian. As Dave said it was wonderful to listen to the sound of the Italian poetry, who cares what it means! But thanks to the translations we did know what it meant and the audience was entranced by the variety - the love poems of Luca Artoli, Fabio Barcellandi's meditations on belief, good and evil and the word and the latex poems by Andrea Garbin. To the Ponte Vecchio as it happened . . . The tour continues tonight in Galway at the Summer Writers' Extravagana, at 8p, Saturday evening at the Castle Bar in Derry at 9pm, and at Ó Bheál in Cork on Monday next 27 June. Go see and hear them if you can! Our first international guests at the Boyne Reading and Open Mic. 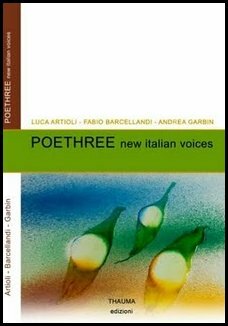 Luca Artioli, Andrea Garbin, Fabio Barcellandi and their translator Dave Lordan will be reading in venues across Ireland as part of a national tour to promote the book Poethree- New Italian Voices. On Thursday 23 June, that's today, they will be at the Coffee Shop, Knightsbridge Retirement Village, Longwood Road, Trim. Time: 8pm. All welcome. Open Mic follows reading. Tea/coffee and delicious home made biscuits afterwards. 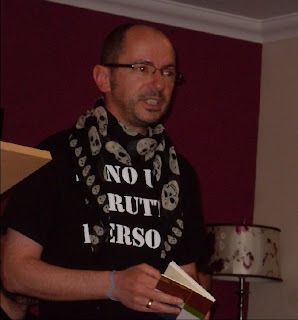 Another of the poets who read with me at the Seven Towers Twisted Pepper Cafe reading last Saturday, Noel Duffy, is launching a poetry collection this week. 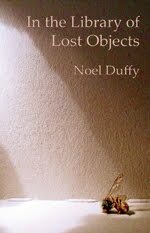 Poetry Ireland presents the launch of Noel Duffy's debut collection, In the Library of Lost Objects, this evening Wednesday 22 June at 6.30pm Damer Hall, St Stephen's Green, Dublin 2 with introduction by Niall MacMonagle. The reading on Saturday was great, four poets taking turns to read a poem of two in a kind of round of three of four turns if you know what I mean. The poets found themselves changing their choices in response to poems read by others, the poems began to talk to each other as someone once said. I'm afraid I was the exception I just read bits from my walk-into-Dublin-centre poem which actually worked well as a kind of counterpoint to the others. A very enjoyable afternoon reading. Sean Kenny, Co Meath - Hibernia, here I come! 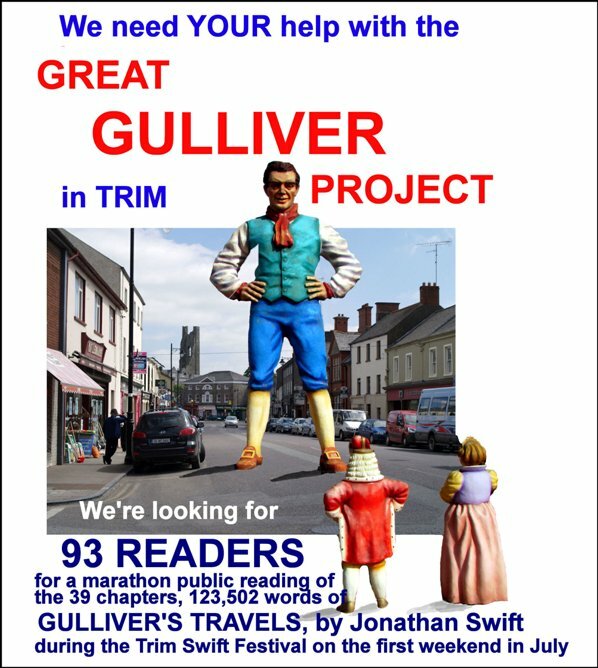 The result will be announced by the beginning of next week and the winner invited to read the winning entry at the official opening of the Trim Swift Festival on Thursday 30 June in Trim. Pauline Fayne was one of the poets who read at the Seven Towers Twisted Pepper cafe reading on Saturday. Very impressive material, dark and light, witty and insightful. The Dublin launch of her 'Mowing in the Dark New and Selected poems', published by Revival Press, Limerick will take place in The Irish Writers Centre, Parnell Square at 7.30p.m. tonight Monday the 20 June 2011. All welcome. And later in the week, Airfield Writers launch of their broadsheet The Mews and are hosting an open-mic evening on Wednesday 22 June at 7.30 pm in The Library of Airfield House. Bring your poem/ flash fiction – no longer than two minutes, please. Or just lend an appreciative ear and enjoy a complimentary glass of wine. For directions to Airfield House, see http://www.airfield.ie/about.html. Near Balally stop on the Luas or Exit 13 off the M50 and close to Dundrum. And he enjoyed it, standing stage front, no guitar, just harmonica, lapping it up. A great concert, one of the best ever I thought but I could be biased. The venue is great, lots of parking, well organised, lots of space, a good seat and a great crowd - exactly as it was when I saw him there on his last visit. The show started at four minutes past eight and from the start it was clear Bob was engaged, happy, and in great form. We had heard he had been spotted in west Cork a day or two previously so the scenery must have agreed with him. He looked well, did a lot of stage-front facing the audience, throwing shapes. A nice setlist, starting with Gonna Change my Way of Thinking and including many of the great hits and a few from recent albums. He sang two of the Mississippi-floods apocalyptic-doom songs discussed at the recent Bristol conference The Levee's Gonna Break and High Water. Apart from the finale the stand out song was a terrific Tangled Up in Blue sung as I have never heard it before. Centre stage, it was as if Bob was saying Come here, I have this fantastic story to tell and he told it with a slow paced delivery which gave a completely new feeling to the song. There's a harmless little piece on the Irish Times website about the concert, most of which could have been written without attending the show. The picture isn't from the Cork concert - he wore a black hat. Anyway as you might gather I enjoyed the night! Tomorrow, Saturday, Seven Towers are holding a 'Dublin Can Be Heaven' poetry reading , featuring readings from Seven Towers writers and me! 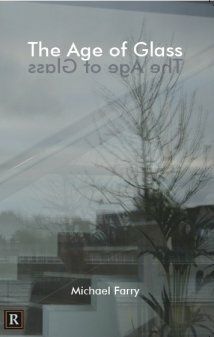 Saturday, June 18, 2011 At 03:00 PM for 1 Hour at the Twister Pepper Cafe and Bookmart, Middle Abbey St., Dublin. Noel Duffy was born in Dublin in 1971 and studied Experimental Physics at Trinity College, Dublin, before turning his hand to writing. He co-edited (with Theo Dorgan) Watching the River Flow: A Century in Irish Poetry (Poetry Ireland, 1999) and was the winner in 2003 of the START Chapbook Prize for Poetry for his collection, The Silence After. and made into dentures for the affluent classes. Anne Tannam was born in 1966 in Dublin, got a diploma in life coaching, learned to stop for a while and figure out how she wanted to live. Began writing. Continued to juggle but less frantically. Kept writing, loved writing, wrote a book. 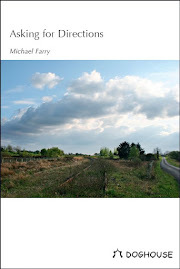 Has just published her first poetry collection Take This Life. Pauline Fayne was born in 1954 and lives in Tallaght, Co. Dublin. 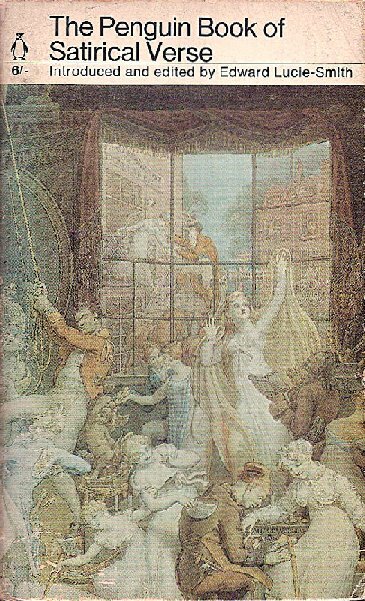 Her first collection Journey was published in 1979 by Sheveck Press. Two other collections have been published since and her fourth collection Mowing in the Dark will be published by Stonebridge in 2010. Pauline’s work has been included in several anthologies and has also been broadcast on RTE Radio 1 and BBC Radio 4. Trim Swift Festival is noted for its innovative ideas. OK the idea of a public reading of a classic is not exactly new but reading it in the back seat of a car and charging two people to sit in the front and listen. Gives a new slant to back seat driving! Each reader will pay 5 euro to read three pages of the book, an audience of 2/3 people in the front seat will pay 2 euro each to listen for 15 minutes. Proceeds in aid of Aware. All this in a parked (I hope) car in Market Street in Trim 1pm to 6pm on Friday 1 July and Saturday 2 July and 10am to 3pm on Sunday 3 July. Full details here. Congratulations to Boyne Writers Group member, Orla Fay, whose short story, Safa, has been selected as one of the June winners of The Lonely Voice Short Story Introductions at the Irish Writers Centre. The judge was Leo Cullen and Orla and the other winners will be reading their stories on Wednesday, 6th July, in the Irish Writers' Centre. Well done Orla! Also good luck to member Tom Dredge whose poem, Progress, has been short listed for the WOW! Awards. The results will be announced on this Friday 17 June. 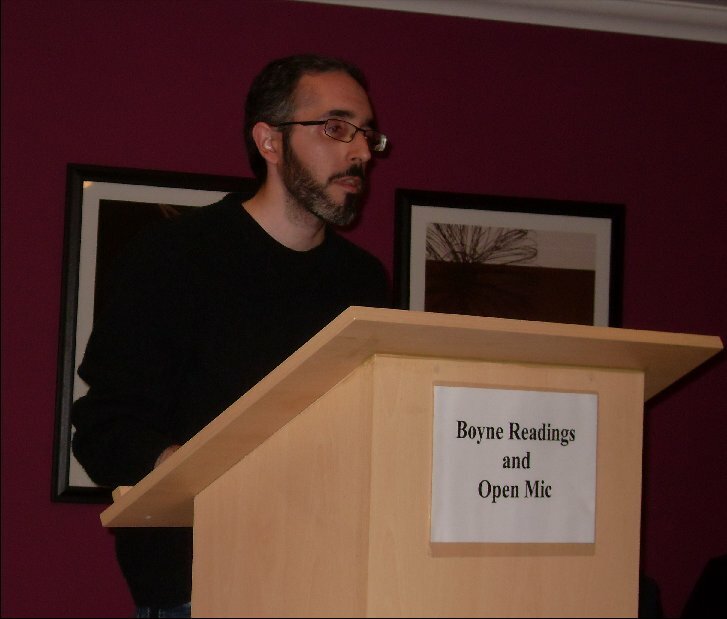 Our June Boyne Readings and Open Mic promises to be special. As part of their a national tour to promote the book Poethree-New Italian Voices (Thauma Edizioni, 2011) which is an Italian/English anthology. 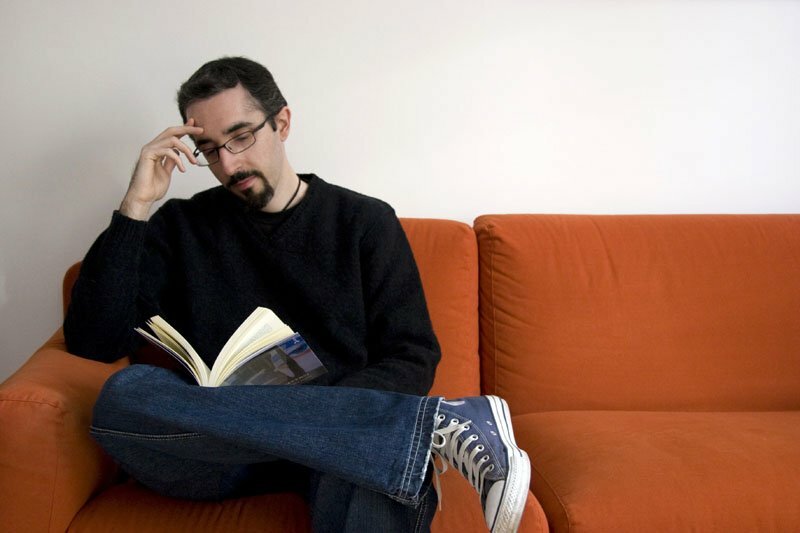 Three Italian poets will read from the anthology as will the Irish poet/translator Dave Lordan. Dave Lordan's latest collection is Invitation to a Sacrifice (Salmon Poetry, 2010) which was called by The Irish Times 'an act of cultural resistance, as brilliant on the page as it must surely be in performance'. Eigse Riada theatre company produced his first play, Jo Bangles, at the Mill Theatre, Dundrum in 2010 and his first collection of short stories ‘Out of My Head’ is due out from Salmon Publishing in Summer 2012. The three Italian poets are Luca Artioli (above) who was born in Mantova in 1976 and still lives there, Fabio Barcellandi who was born in Brescia in 1968 and Andrea Garbin who lives and works in the province of Mantova. The Reading takes place in the Knightsbridge Home Coffee Shop at 8pm on Thursday 23 June. An Open Mic follows the Reading so we have a chance to showcase the work of local poets. This should be great night and a good was to finish off the second season of Boyne Readings before the summer break. One of our LitLab members, Julieanne Lynch, has recently had her novel, In the Shadows, published in America. At the moment it is only available as a Kindle edition but the paper version is due to be published later this year. The Kindle version is doing very well. 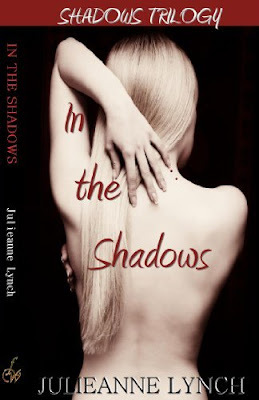 The novel, In the Shadows, described as one hot vampire read, is the first of a Shadow World trilogy. She is working on the second book, Walking with Shadows, and we have had a few sneak previews though she seems to spare us the gory bits! The Shadows Trilogy, is published by Firefly & Wisp Publishing. It follows the war between vampires and shadow creatures. Giselle Bergman, an 18-year old human girl, falls victim to a scheme by one of her closest childhood friends, and embarks on a journey that sees her become the centre of a battle between good and evil. Now here's a novel way of celebrating Bloomsday and in a setting which has recently been in the news. 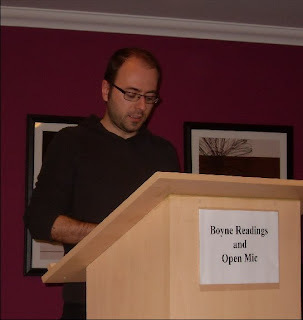 Nice to see Kieran Furey who read at one of our recent Readings and Open Mics there as well. And an Open Mic included - be a part of Bloomsday yourself! On June 16th, the Irish Writers’Centre will be celebrating Bloomsday, not with Leopold - Joyce’s great flaneur- but with Finnegan and his wake at the Garden of Remembrance. The Writers’ Centre along with Poetry Ireland will provide a varied afternoon’s entertainment between 12 noon and 3pm, mixing poetry and prose with music and song. This traditional Irish ‘wake’ will both commemorate the work of Ireland’s late, great writers and provide a platform to admire the wonderful writing being created in modern Ireland! Celebrations will begin at twelve noon with an hour of musical entertainment from Comhaltas Ceoltóirí Éireann. One o’clock will bring prose performances by Conor Kostick, June Considine, Catherine Dunne, Mia Gallagher, Mícheál O Ruairc and Declan Collinge. 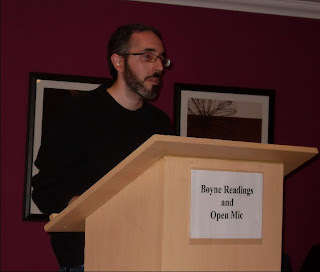 There will also be poetry readings by Mark Granier, Kieran Fury and Padraig J Daly among others. Each writer will read some of their own work along with that of another Irish writer that they feel influences, informs or inspires them. Between two o’clock and half past three, there will be an open mic session, where everyone will be encouraged to add their own flavour to the day’s proceedings. It promises to be a great afternoon full of literary laughs! For more information, please visit the Irish Writers’ Centre website. First draft of the history book finished. 80,000 words instead of 70,000 so some pruning/consolidation needed. But not just that, rewriting also which means re-reading what's written, some extra research in some cases, and then a rewrite to change the emphasis or the meaning or the interpretation or all three. 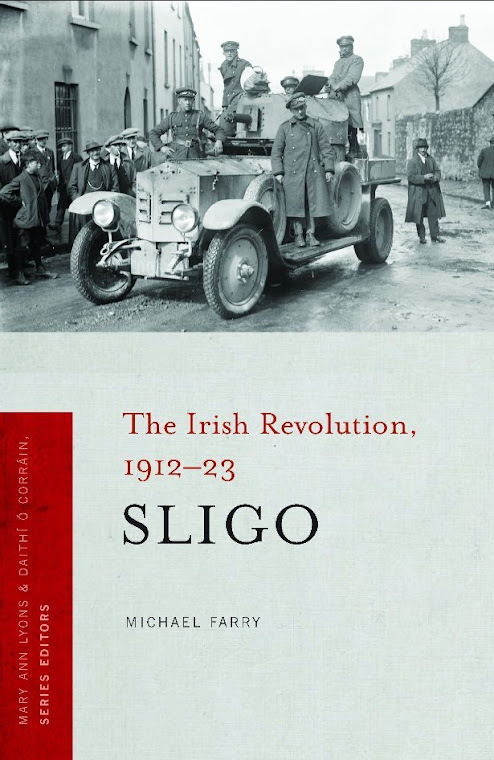 Tedious work but essential if the book is to be the survey of the period 1912-1923 in the county Sligo. And footnotes, following the style so having to check where the stops and commas go, what has to be italicised and what abbreviations are allowed and where. Now that is tedious. And finalising photographs. These should not have been published before at least recently. I found some great ones in Bedford taken by the Regiment's photographer, presumably one of the officers. He could have done with some training in the art he had a habit of cutting off the tops of building so we get some burned out RIC barracks without chimneys. It's great to find these and they will add to the book. Other photographs are turning up from relations of people who were active in that period, some gems. So a lot of things at the moment are being filed away in the After I Finish the Book file. Paul Simon has a song called Rewrite on his new album which has got some very good reviews. The album, So Beautiful or So What, is being streamed online. And while I'm on about satire just a mention for our Swift Satire Competition closes on Tuesday next. This year's theme, Travels Into Several Remote Nations Of The World: Ireland 2011, has been prompted by the sudden interest among prominent dignitaries - so far, Queen Elizabeth and President Obama - in visiting Ireland this year. Entries have been trickling in, there's always a rush at the end. It's not too late to enter, the prizes are pretty good, a total of 1,000 euro. All the details are on this page. The Boyne Writers website also has links to previous winners and their winning entries. 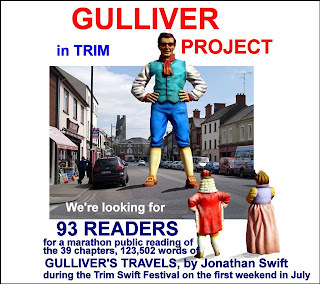 Less than a month to go to the Trim Swift Festival and satire is on my mind. Swift was a master of course in prose pieces such as the well-known A Modest Proposal but also much of his verse in elegant rhyming couplets. 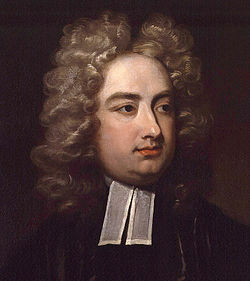 Somehow satire in poetry should be like his, with lots of ingenuous rhymes. The Battle of the Books is the immediate concern. This annual satire competition between our group and the other group has become an important fixture in the festival. We won the first year, the others last year so this year's contest assumes an added importance. Not that we care who wins you understand, it's the taking part that matters. I wrote a rhyming take on the Celtic Tiger Recession Blues for the first contest and last year a sonnet satire subtitled A Typical Ulster Lyric. Both worked well but this year I'm going to try some prose - don't tell the others mind. At our Boyne Writers Group meeting Thursday evening we listened to the first versions of our efforts and very impressive they were too. Variety is what we're after with satirical attacks on some less obvious targets. Confidence is growing among us. The others meanwhile have been keeping very quiet about their preparations in their various blogs and blogs and blogs. Hmmm I wonder what they're up to. Of course the question always is Is it satire? I can't really explain what satire is but I think I can recognise it when I hear or read it. I bought a second-hand copy of The Penguin Book of Satirical Verse in the Oxfam bookshop in Oxford last week but it's not much help - very little 20th century stuff in it. I'll enjoy reading it when I get time. The Trim Swift Festival is less than a month away. Indeed the Stand Up Row has already started. Last night teams from some Trim pubs took part in a first round match. This competition was devised and very successfully implemented last year by Boyne Writers and Trim Festival Committee member Paddy Smith. Each team member is given a topic and must speak for one minute in favour and then speak for one minute against the topic. Great fun! This year's festival chief attraction is probably UK comic Rory Bremner who will be performing at the round table discussion on Friday night 1 July. He will be joined by, George Hook, John Waters, Minister Leo Varadkar, Minister Pat Rabbitte, Deputy Dara Calleary, Terry Prone, Noel Whelan, Brendan Keenan and more. The Eighteenth-Century Ireland Society’s Annual Conference will be held in association with the Trim Swift Festival and there is a full programme of lectures many of which have a Swift theme. And then there's the Battle of the Books but that's another story!